The governor of the Ulyanovsk region in Russia, Sergej Morozov, and the general director of the development agency of the Ulyanovsk region, Dmitrij Ryabov, have signed an agreement about the construction of a Schaeffler plant in Ulyanovsk. The managing director of Schaeffler Manufacturing Rus, LLC, Mikhail Volkov, signed the agreement on behalf of Schaeffler. 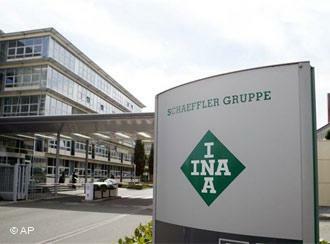 The agreement will be signed by Schaeffler management in Germany during the next few days. Schaeffler is planning to set up its first manufacturing location in Russia in the Volga region. “We have successfully met some very ambitious targets during the last few years. Ulyanovsk has developed to become one of the most attractive regions for investors in Russia due to the creation of a favorable climate for investment and its close collaboration with global companies. The Schaeffler Group is one of the leading suppliers to various industries – not only in Europe, but all over the world. The investment in this excellent project in the Ulyanovsk region is worth around 2 billion rubles and it will create 450 new jobs in the next five years”, announced Sergej Morozov, governor of the Ulyanovsk region. Schaeffler would like to increasingly participate in the upturn and the growth in the region and further develop its business in Russia. “I am very pleased that we will soon be opening a manufacturing location in Russia and that we will be able to supply our customers directly. The conditions in the region are very good and cooperation with the authorities was very constructive”, said Dr. Juergen M. Geissinger, CEO of Schaeffler AG. “The plant in Ulyanovsk will become part of our global network of manufacturing locations and will manufacture products for various applications for both our Automotive and Industrial divisions. The total investment is around 2 billion rubles”, he continued. “This plant for industrial and automotive components will be built on a site measuring 22 hectares in the Zawolzhje regional industrial park,” Mikhail Volkov, managing director of Schaeffler Manufacturing Rus, LLC, added. “Schaeffler AG, one of the largest international companies, is investing in the Ulyanovsk region and constructing a high-technology manufacturing location. This direct foreign investment is targeted at developing the Ulyanovsk region, especially its automotive industry. We are extremely hopeful that the company will also extend its production capacities in our region after successfully starting the project”, explained the general director of the development agency for the Ulyanovsk region, Dmitrij Ryabov. Schaeffler’s commitment fulfills the requirements for high-priority investment projects in Russia at federal level. This status offers increased investment security. Construction is scheduled to start at the beginning of next year and the start of production is planned for the beginning of 2014. The plant will mainly manufacture products for national and international automotive manufacturers, but will also produce components for the railway industry. Russia also wants to renew and develop its infrastructure in preparation for major sporting events such as the World Cup in 2018. The city of Ulyanovsk has approximately 700,000 inhabitants and is the capital of the Ulyanovsk region. It is located approximately 900 kilometers east of Moscow. This region on the Volga has developed into a major industrial center, particularly for automotive manufacturing, mechanical engineering and the aviation sector and is an important transportation hub with a long-distance train station, international and regional airports and an inland port. Schaeffler has been active in Russia since 1997. The headquarters in Moscow and offices in St. Petersburg, Novosibirsk, Togliatti, Yekaterinburg, Krasnodar, and Kazan currently ensure that the company has fast and direct contact with its customers.